Bengaluru FC came back from two goals down but couldn’t do enough to eke out a win against a ten-man Sporting Clube de Goa at the Fatorda Stadium, in Goa, on Sunday. The game ended 2-2 after skipper Sunil Chhetri struck once in each half after a freak Mascarenhas goal and an Odafa Okolie strike gave the hosts a lead. Bengaluru were dealt with an early blow after defender Curtis Osano had to be replaced by Keegan Pereira after the former pulled his groin just fifteen minutes into the game. The home side took the lead with a freak goal just two minutes later after Lalthuammawia Ralte’s clearance from a Lalchhuanmawia back-pass rebounded off an onrushing Marcus Mascarenhas and bounced into the Bengaluru goal. The Blues tried their best to reduce the deficit recycling well in midfield to let Udanta and Chhetri attack the flanks. Striker Kim Song Yong came close to scoring the Blues equalizer but a cross into the box from Udanta was inches away from the diving North Korean. Against the run of play, Sporting extended their lead through a long-range shot from Odafa Okolie. The Nigerian striker collected a pass from Mahmoud Al-Amna before taking a shot that found its way past a diving Ralte in the Blues’ goal. But Bengaluru clawed right back into the tie at the death of the first half when Loveday Okechukwu brought down John Johnson in the box and referee Santosh Kumar promptly pointed to the spot where Chhetri found the Blues’ opener from. Booked for the foul, Loveday received marching orders only a minute later when he hacked down Udanta while the winger was charging down the right. Starting the second half with a goal to show for and a man more than Sporting, Bengaluru switched gears, leaving the hosts to defend deep. Michael Collins came close to getting Bengaluru an equaliser and what could have been his first goal for the Blues only to see his goal-bound low drive pushed out by Arindam Bhattacharya. Bengaluru eventually did find their equaliser when Chhetri tapped into an empty goal after Daniel Lalhlimpuia’s cross fell perfectly for the skipper. 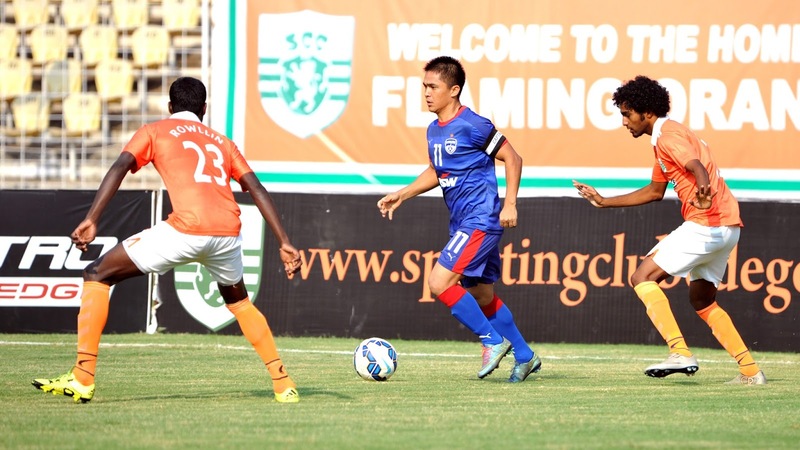 The Blues ventured forward with intent and came close to finding a winner when a strike from inside the area by Lalchhuanmawia went inches high of the Sporting frame. The result leaves Bengaluru second on the table, level on points with Mohun Bagan, who have a game in hand over the Blues. Westwood’s men return to AFC Cup duties as they face defending Champions Johor Darul Ta’zim at the Kanteerava Stadium, on Wednesday.